"Sometimes, I just come across them," Creswell said. "I find a lot of them in the New Hanover County library." Creswell, a Rocky Point resident, works as an environmental health program specialist for the Pender County Health Department. 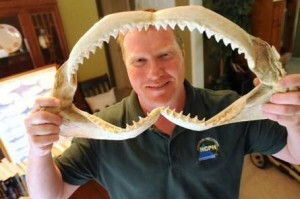 But outside of regular business hours, he hunts down details about shark attacks in North and South Carolina as a volunteer case investigator for the New Jersey-based nonprofit Shark Research Institute. "When a bite occurs, I try to track down the victim," Creswell said. "Sometimes, someone will call me directly about an attack, but usually I hear it from the news. I get the victim's name and try to contact them. If I get in touch, I have a questionnaire. I also try to get pictures of the wound pre-operation." That information is recorded in a global shark attack database, available for free online to researchers and shark enthusiasts. The project has several goals, including dispelling persistent myths that sharks are crazed human-eaters who lurk just offshore, waiting to prey on innocent beachgoers. "When you look at the spreadsheet, you see that in the vast majority of incidents, nobody is hurt, or it's minor," said Marie Levine, founder and executive director of the Shark Research Institute and archivist for the global database. "Yet there's this fear of sharks, ever since ‘Jaws.' It's a fear of the unknown, of animals that people don't understand." During a decade of data gathering, Creswell has researched just one fatal shark attack, off the Outer Banks in 2009. The vast majority of cases usually result in minor injuries that require stitches, most commonly noted in the database as "lacerations to foot" or "heel bitten." When he locates a victim willing to be interviewed, Creswell works from a standardized questionnaire that collects information on a variety of conditions, ranging from water temperature and fish activity to whether the person was wearing jewelry. The data allows researchers to establish patterns among shark attacks, Creswell said. "They tend to happen in the late afternoon, usually 5 p.m. or later," he said. "That's the time of day that fish are coming closer to shore. Sharks are predators – they just follow the food." Which doesn't include humans. Typically, bite victims – about three to four per year in the Carolinas – are simply in the wrong place at the wrong time. "Usually you're just standing there, and there's feeding activity and your hand or foot gets mistaken for a fish," Creswell said. "They're just trying to survive. There's no malice in any attack. A shark doesn't even know what a human is."